Xide is an alcopop brand from Carlsberg in Sweden. Åkestam Holst, Stockholm, was given the brief of finding a new way to revitalize the brand. 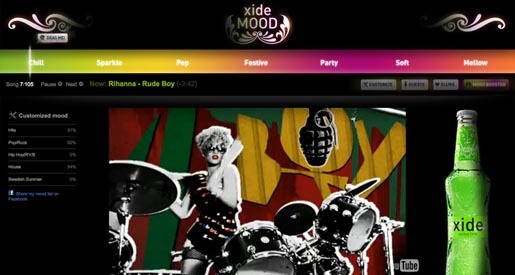 The agency worked with The Brewery to create Xide Mood, an application that connects your favourite mix of music with the different moods of a party. Today everybody wants to be a DJ, and the playlist on the laptop is a focal point at every party. And just like music can create the right mood, maybe the different flavours of Xide could be emphasized with music? 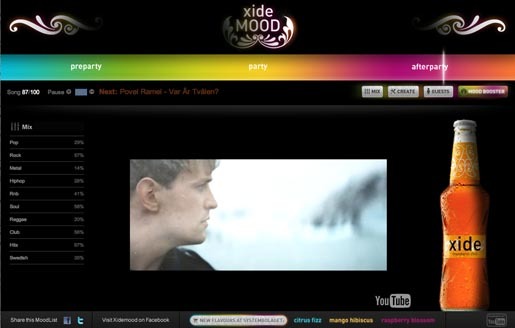 The site allows visitors to adjust their ratio of pop, rock, metal, hip hop, r’n’b, soul, reggae, club, hits and Swedish, creating preparty, party and afterparty mixes of YouTube music videos. Guest mixes are provided by Petter, Lazee, Daniel Nyhlen, Dregan, Anna Hibbs, Angela Monroe, David Druid, Lisa Cornellusson, Joseph Shirazl, Tobias Karlsson, Lars Wallin and Denise Lopez. Party goers can test out the Mood Booster on their webcams. The more movement the higher the mood. The Xide Mood site was developed at Åkestam Holst by creative director Martin Cedergren, art director Yvan Archimbaud, copywriter Adina Asplund, planner Mikael Grenros, account director Fredrik Widén and account manager Bella Lagerquist. Graphic and interactive design was by Joakim Håhl and Daniel Termin at The Brewery.